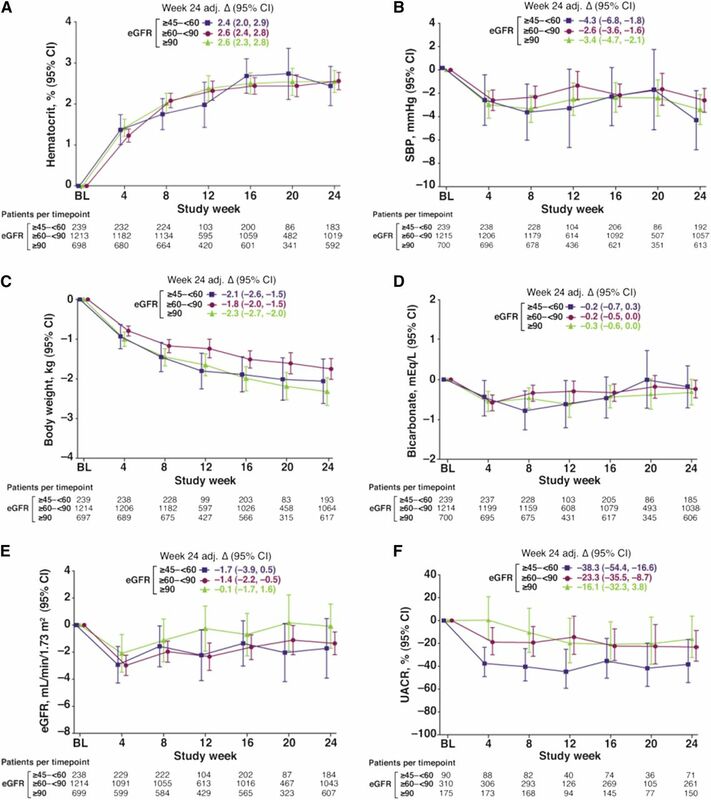 Background and objective Sodium glucose cotransporter 2 inhibition with dapagliflozin decreases hemoglobin A1c (HbA1c), body weight, BP, and albuminuria (urinary albumin-to-creatinine ratio). Dapagliflozin also modestly increases hematocrit, likely related to osmotic diuresis/natriuresis. Prior studies suggest that the HbA1c–lowering effects of dapagliflozin attenuate at lower eGFR. However, effects on other cardiovascular risk factors at different eGFR levels are incompletely understood. Design, setting, participants, & measurements This pooled analysis of 11 phase 3 clinical trials assessed changes in HbA1c, body weight, BP, hematocrit, and urinary albumin-to-creatinine ratio with placebo (n=2178) or dapagliflozin 10 mg (n=2226) over 24 weeks in patients with type 2 diabetes according to baseline eGFR (eGFR≥45 to <60 ml/min per 1.73 m2, eGFR≥60 to <90 ml/min per 1.73 m2, and eGFR≥90 ml/min per 1.73 m2). Results Compared with placebo, reductions in HbA1c with dapagliflozin were 0.6%, 0.5%, and 0.3%, respectively, for each consecutive lower eGFR subgroup (P value interaction <0.001). Effects of dapagliflozin on hematocrit, body weight, and BP were similar regardless of baseline eGFR, suggesting that effects potentially related to volume and natriuresis are eGFR independent. Moreover, among individuals with baseline urinary albumin-to-creatinine ratio ≥30 mg/g, placebo-adjusted reductions in urinary albumin-to-creatinine ratio were larger in the lowest eGFR subgroup (P value interaction <0.001). Adverse events occurred more frequently in the lowest eGFR subgroup; this was true for both dapagliflozin- and placebo-treated patients. Conclusions The HbA1c–lowering effects of dapagliflozin decrease as renal function declines. However, dapagliflozin consistently decreases body weight, BP, and urinary albumin-to-creatinine ratio regardless of eGFR. These effects in conjunction with the finding of similar effects on hematocrit, a proxy for volume contraction, suggest that the effects of dapagliflozin are partly mediated via nonglucosuric-dependent mechanisms. Dapagliflozin belongs to a new class of oral glucose-lowering drugs. Dapagliflozin selectively inhibits the sodium glucose cotransporter 2 (SGLT2) and has been shown to improve glycemic control by decreasing renal glucose reabsorption in the kidneys and increasing urinary glucose excretion (1). In addition, dapagliflozin has also been shown to decrease body weight, BP, uric acid, and albuminuria, which are associated with increased renal and cardiovascular risk in patients with type 2 diabetes (2–6). The glucose-lowering effect of SGLT2 inhibitors depends on the amount of glucose filtered in the glomerulus. Therefore, in patients with a reduced eGFR, the efficacy to augment urinary glucose excretion and decrease hemoglobin A1c (HbA1c) is diminished compared with patients with preserved renal function (7,8). This decreased ability to improve glucose control has led to a recommendation not to use SGLT2 inhibitors in patients with impaired renal function. However, it is unclear whether effects of SGLT2 inhibition on other renal and cardiovascular risk markers also depend on eGFR. The aim of this study was, therefore, to first characterize the effect of dapagliflozin on multiple renal and cardiovascular risk markers as a function of eGFR in a pooled analysis of 11 randomized, controlled clinical trials. Secondly, we assessed whether changes in systolic BP and body weight during dapagliflozin treatment parallel changes in HbA1c within individual patients at different eGFR levels. Data from phase 3 studies of 24 weeks in duration (11 studies) from the dapagliflozin clinical development program in patients with type 2 diabetes were included. The study characteristics and patient populations enrolled in each study are described in Supplemental Table 1. These studies compared dapagliflozin 10 mg with placebo as monotherapy or in combination with other glucose-lowering therapies, including metformin, sulfonylureas, thiazolidinediones, insulin, and dipeptidyl peptidase-4 inhibitors. Two studies were included that enrolled patients at high cardiovascular risk. Detailed methods for individual studies were described previously (2,9–17). The study protocol of each study was approved by independent ethics committees or local and central review boards. All participants signed informed consent before any study-specific procedures commenced. The effects of dapagliflozin 10 mg/d compared with placebo were determined in patients according to their baseline eGFR (eGFR≥45 to <60 ml/min per 1.73 m2, eGFR≥60 to <90 ml/min per 1.73 m2, and eGFR≥90 ml/min per 1.73 m2). eGFR was calculated with the Modification of Diet in Renal Disease equation. Changes from baseline to 24-weeks follow-up with dapagliflozin compared with placebo in the following biochemical and physical risk markers were assessed: urinary glucose-to-creatinine ratio, HbA1c, hematocrit, serum bicarbonate, body weight, systolic and diastolic BPs, pulse pressure, eGFR, and uric acid. In a subgroup of patients with baseline urinary albumin-to-creatinine ratio (UACR)≥30 mg/g (n=1210), the effect of dapagliflozin compared with placebo in percentage change in UACR was also determined. Urinary albumin and urinary creatinine were measured in spot urine samples. All biochemical assessments were conducted in central laboratories in each study. Descriptive statistics were used to describe the baseline characteristics and safety of patients in the pooled analysis of these trials. The effect of dapagliflozin 10 mg/d relative to placebo was analyzed with a longitudinal repeated measures mixed model with fixed categorical effects of treatment, week, treatment-by-week interaction, study, eGFR subgroup, treatment-by-eGFR subgroup interaction, week-by-treatment-by-eGFR subgroup interaction and addition of a continuous covariate of the respective baseline risk marker, baseline risk marker-by-study interaction, and baseline risk marker-by-week interaction in the model. Adjusted mean percentage change from baseline, difference between dapagliflozin 10 mg/d and placebo, and 95% confidence interval (95% CI) of the difference were back transformed from the results under the logarithm transformation for UACR. If HbA1c exceeded predefined thresholds, patients were eligible to receive rescue medication. The efficacy calculations for this pooled analysis were performed excluding data collected after institution of HbA1c-lowering rescue therapy. Pearson correlations were calculated to investigate to what extent changes in systolic BP or body weight paralleled changes in HbA1c during dapagliflozin treatment in individual patients. In addition, the dapagliflozin-treated population was stratified by response in each risk marker. A response was defined as a reduction from baseline in the risk marker at week 24. Subsequently, 2×2 tables were prepared of systolic BP and HbA1c, as well as body weight and HbA1c, in the three eGFR subgroups, and the proportions of patients with various response patterns were calculated. All analyses were performed with SAS/STAT v.8.2 or higher (SAS Institute Inc., Cary, NC). A total of 4404 patients, from 11 randomized, controlled clinical trials, randomized to receive dapagliflozin 10 mg/d or matched placebo were included in this analysis. Of these, 1394 had an eGFR≥90 ml/min per 1.73 m2, 2484 had an eGFR between ≥60 and <90 ml/min per 1.73 m2, and 526 had an eGFR between ≥45 and <60 ml/min per 1.73 m2. Patients with an eGFR between ≥45 and <60 ml/min per 1.73 m2 at entry into the study were older, more likely to be women, have a higher body weight, and have a longer duration of diabetes (Table 1). There were no differences in baseline characteristics between dapagliflozin- and placebo-assigned patients in each eGFR category. In total, 1210 (27.5%) patients had UACR≥30 mg/g. Baseline albuminuria was well balanced across eGFR categories within this subgroup (Table 1). After 24 weeks of therapy, the placebo-corrected reduction in urinary glucose-to-creatinine ratio with dapagliflozin was progressively smaller in patients with eGFR≥45 and <60 ml/min per 1.73 m2 compared with patients with eGFR≥60 and <90 ml/min per 1.73 m2 and patients with eGFR≥90 ml/min per 1.73 m2 (Figure 1A). Compared with placebo, reductions in HbA1c after 24 weeks of treatment with dapagliflozin were 0.6%, 0.5%, and 0.3%, respectively, for each consecutive lower eGFR subgroup (P value interaction <0.001) (Figure 1B). Reductions in urinary glucose-to-creatinine ratio and HbA1c with dapagliflozin compared to placebo were progressively smaller for each consecutively lower eGFR subgroup durng 24 weeks treatment. Effect of dapagliflozin on (A) urinary glucose-to-creatinine ratio and (B) hemoglobin A1c (HbA1c) according to baseline eGFR. BL, baseline; 95% CI, 95% confidence interval. Dapagliflozin treatment increased hematocrit relative to placebo. This effect was consistent and independent of baseline eGFR (Figure 2A). Effects of 24 weeks of treatment with dapagliflozin compared with placebo on systolic BP were similar among eGFR sub groups, being −3.4 (95% CI, −4.6 to −2.1) mmHg, −2.6 (95% CI, −3.6 to −1.6) mmHg, and −4.3 (95% CI, −6.8 to −1.8) mmHg, respectively, for each consecutive lower eGFR subgroup (Figure 2B). Moreover, compared with placebo, reductions in body weight, pulse pressure, and uric acid were similar in each eGFR subgroup (Figure 2C, Supplemental Figure 1). Finally, dapagliflozin caused a modest reduction in bicarbonate. The change in bicarbonate was similar in each eGFR subgroup (Figure 2D). Effects of dapagliflozin relative to placebo on hematocrit, body weight, BP, bicarbonate, eGFR and albuminuria were similar regardless of baseline eGFR during 24 weeks treatment. Effect of dapagliflozin on (A) hematocrit, (B) systolic BP (SBP), (C) body weight, (D) bicarbonate, (E) eGFR, and (F) albuminuria according to baseline eGFR. BL, baseline; 95% CI, 95% confidence interval; UACR, urinary albumin-to-creatinine ratio. Baseline eGFRs were 103 (SD=12) ml/min per 1.73 m2, 76 (SD=8) ml/min per 1.73 m2, and 54 (SD=4) ml/min per 1.73 m2, respectively, in each consecutive lower eGFR subgroup. Relative to placebo, dapagliflozin caused an initial decrease in eGFR in each subgroup. At week 4, placebo-corrected changes in eGFR were −2.1 (95% CI, −3.5 to −0.7) ml/min per 1.73 m2, −3.0 (95% CI, −3.7 to −2.2) ml/min per 1.73 m2, and −2.9 (95% CI, −4.3 to −1.6) ml/min per 1.73 m2, respectively, in each consecutive lower eGFR group. eGFR was fairly stable in the dapagliflozin arms during subsequent follow-up but did not return to baseline (Figure 2E). Among 1210 patients with UACR>30 mg/g, median baseline albuminuria was approximately 80 mg/g, with no apparent difference across eGFR subgroups. Compared with placebo, reductions after 24 weeks of dapagliflozin therapy were −16.1% (95% CI, −32.3% to +3.8%), −23.3% (95% CI, −35.5% to −8.7%), and −38.3% (95% CI, −54.4% to −16.6%), respectively, in each consecutive lower eGFR subgroup (P value interaction <0.001) (Figure 2F). An additional analysis was conducted to investigate the extent to which responses in HbA1c were paralleled by responses in systolic BP or body weight during dapagliflozin treatment in various eGFR subgroups. Weak correlations between changes in HbA1c and changes in systolic BP or body weight were observed in all eGFR subgroups (Table 2). Among patients with eGFR≥90 ml/min per 1.73 m2, 47.6% of patients showed a reduction in both HbA1c and systolic BP, whereas 5.7% of patients did not show a response in both parameters. With respect to body weight, 66% of patients showed a reduction in both HbA1c and body weight (Table 2). The proportion of patients with a response in both HbA1c and systolic BP or HbA1c and body weight was lower in the eGFR≥60 to <90 ml/min per 1.73 m2 subgroup (42.8% and 62.4%, respectively) and further decreased in the eGFR≥45 to <60 ml/min per 1.73 m2 subgroup (33.3% and 51.2%, respectively). A higher overall rate of adverse events and serious adverse events was observed in patients in the lowest eGFR group, but this was true for both the placebo and dapagliflozin groups. The proportion of patients with hypoglycemia in the lowest eGFR subgroup was lower in the dapagliflozin versus the placebo group, whereas in the highest eGFR group, this proportion was higher in the dapagliflozin group. Genital infections occurred more frequently in the dapagliflozin group. The relative risk for this adverse event associated with dapagliflozin was similar in all three of the eGFR subgroups. Adverse events related to renal function were most common among patients in the lowest eGFR subgroup. In this subgroup, there was also a higher incidence in dapagliflozin- compared with placebo-treated patients (Table 3). The events in the dapagliflozin group were largely related to increases in creatinine. There were no serious renal adverse events in either treatment group among patients in the lowest eGFR subgroup. There was also no difference between groups in the frequency of serious adverse events potentially related to volume constriction. SGLT2 inhibition with dapagliflozin has been shown to improve glycemic control, but the efficacy attenuates at lower eGFR (7). This post hoc pooled analysis involving >4000 patients from 11 randomized, controlled clinical trials confirmed these results. Interestingly, this analysis showed that the effects of dapagliflozin on BP, body weight, hematocrit, albuminuria, eGFR, bicarbonate, pulse pressure, and uric acid were consistent, regardless of eGFR levels. Long-term hard outcome trials in patients with diabetic kidney disease are needed to assess whether these risk marker changes, induced by dapagliflozin treatment, will translate into renal and cardiovascular protection. Dapagliflozin is currently not recommended in patients with moderate to severe renal impairment, because previous studies showed reduced glucose-lowering efficacy in patients with renal impairment, thereby suggesting potentially less cardioprotection. However, cardiovascular risk is determined by many more risk factors than HbA1c alone. Drug-induced changes in each of these risk factors may change cardiovascular risk (either positively or negatively). Consequently, a more useful approach may be to interpret the effect of SGLT2 inhibition in terms of the whole spectrum of effects on renal and cardiovascular risk markers rather than effects on HbA1c alone (18). The reductions in BP and albuminuria in conjunction with an increase in hematocrit suggest a natriuretic/diuretic pattern that is preserved in patients with impaired renal function. What evidence is available that SGLT2 inhibition confers renal and cardiovascular protection in patients with low eGFR? A large outcome trial in patients with type 2 diabetes and cardiovascular disease reported that the SGLT2 inhibitor empagliflozin markedly decreases renal risk as well as cardiovascular risk (19,20). The cardiovascular benefits were driven by reductions in cardiovascular death and hospitalizations for heart failure, and the effect was consistent in patients with eGFR above and below 60 ml/min per 1.73 m2. Additionally, a meta-analysis of cardiovascular events across the dapagliflozin phases 2b and 3 program suggested beneficial effects of dapagliflozin on cardiovascular outcomes. The results of the meta-analysis suggested that the cardiovascular benefits extended to patients with eGFR<60 ml/min per 1.73 m2 at baseline (21). The ongoing Dapagliflozin Effect on Cardiovascular Events; Thrombolysis in Myocardial Infarction Study Group 58 (DECLARE TIMI-58) Trial (clinicaltrials.gov identifier NCT01730534) will provide more definitive evidence on whether dapagliflozin confers cardiovascular protection in patients with type 2 diabetes at high cardiovascular risk or with established cardiovascular disease. What could be the underlying mechanism of the different response patterns in HbA1c and other cardiovascular risk markers in patients with preserved and impaired renal function? The nonglycemic volume–related effects of dapagliflozin on BP and albuminuria are probably mediated by inhibition of sodium reabsorption in the proximal tubule, leading to increased renal sodium delivery to the macula densa and eventually increased natriuresis, as reviewed elsewhere (22). This leads to volume contraction and restoration of tubuloglomerular feedback, which is manifested by acute reductions in eGFR, albuminuria, and BP. As BP in patients with diabetic kidney disease is often salt sensitive (23,24), we speculate that dapagliflozin-induced responses in BP, hematocrit, and albuminuria become more susceptible to changes in natriuresis. As a result of the lower glucose efficacy at lower eGFR, it is anticipated that sodium delivery of the distal tubule and urinary sodium excretion are also attenuated in patients with lower eGFR. However, because of the higher sodium sensitivity, reductions in BP and restoration of tubuloglomerular feedback may still occur. In addition, recent studies have also suggested a crosstalk between the SGLT2 transporter and the sodium hydrogen exchanger-3 (NHE3) (25). NHE3 is located in the proximal tubule and responsible for approximately 30% of the reabsorption of sodium in the kidney. Inhibition of SGLT2 results in downregulation of NHE3 sodium transport activity, which may also contribute to the natriuretic effects of dapagliflozin (26). A recent mouse study using a proximal tubule–specific knockout of NHE3 reveals a small decrease in serum bicarbonate concomitant with increased natriuresis (27). A small decrease in serum bicarbonate is also seen with dapagliflozin treatment, which may support involvement of NHE3 in natriuretic effects. As a result of the interaction between SGLT2 and NHE3 as well as potential effects (both direct and indirect; e.g., via altered renal renin–angiotensin–aldosterone system activity) on other transporters, the effect of dapagliflozin on electrolyte- and fluid-related parameters may persist in patients with lower eGFR levels. Body weight loss with dapagliflozin has been suggested to be a result of natriuretic effects during the first weeks followed by loss of fat mass during prolonged treatment (28,29). During the 24-week observation period, no clear relationship was observed between eGFR category and change in body weight, despite a substantially larger glucose excretion in patients with high renal function compared with those with low renal function. One might argue that 24 weeks would be too short a timeframe for fully differentiating between loss of fluid and loss of fat due to a caloric deficit. However, also in long-term trials with durations of up to 2 years, no clear dose-response relationship in terms of weight loss between different dapagliflozin doses has been observed (30,31), despite these doses leading to very different degrees of glucose excretion (32). Regulation of body weight is complex; a contributing factor to the observed results could be that compensatory mechanisms striving to retain the initial body weight by increasing appetite would start at a similar level of body weight reduction independent of renal function. Another possible explanation could be a larger volume effect through enhanced sodium excretion in patients with poor renal function compared with a larger effect on fat mass through caloric loss in patients with preserved renal function. Changes in HbA1c and systolic BP or body weight within individual patients did not parallel each other in a substantial proportion of patients. This uncoupling in response was more often observed in patients with impaired renal function, because the response in HbA1c attenuated, whereas responses in BP and body weight persisted. An uncoupling in response is also observed in studies analyzing the effects of angiotensin receptor blockers, like irbesartan and losartan (33,34). These drugs show a variable effect within individual patients on multiple parameters, such as BP, albuminuria, and serum potassium. There are no clear explanations as to why this uncoupling in response occurs, but it is possible that individual susceptibility to changes in natriuresis in response to dapagliflozin may play a role. An interesting observation was that the reduction in UACR was higher in the lowest eGFR group. This may prove fortunate, because reductions in albuminuria over 6 months of treatment are the strongest predictors of renal protection in patients with diabetic kidney disease (35). The effect of dapagliflozin on albuminuria seems to be a direct effect and cannot be explained by changes in HbA1c, BP, body weight, or eGFR (4). Similar findings of a direct effect of SGLT2 inhibition on albuminuria have been observed for empagliflozin (36). The dapagliflozin phase 3 program has not given any indications of any serious untoward effects on renal function. The increased frequency of renal function–associated adverse events in patients with low baseline eGFR has been associated with transient increases in creatinine and often, protocol-mandated registrations of these laboratory changes as adverse events. Indeed, previous studies have shown acute effects of SGLT2 inhibitors on eGFR that are completely reversible directly after drug discontinuation (4,8). It is reassuring to note that there is no increase in serious renal adverse events in patients with poor renal function as shown in this post hoc analysis as well as in a dedicated study of patients with CKD. This is also in line with other post hoc investigations associating dapagliflozin with a beneficial effect on albuminuria in the short term as well as long-term effects on both albuminuria and eGFR (4,5). This study has limitations. Twenty-four–hour urine collections for natriuresis assessment were not available. We are, therefore, unable to verify whether the natriuretic effects of dapagliflozin are consistent in the eGFR subgroups. Additionally, availability of plasma volume and extracellular volume measurements would aid in further characterizing the volume-related effects of dapagliflozin in patients with preserved and impaired renal function. Finally, albuminuria was measured in untimed single first morning void urine samples, and BP was measured by repeated peripheral upper arm office measurements. Both variables could potentially have been measured by other more precise methods. However, the variability in these assessments did not preclude the detection of robust patterns in the described variables. In conclusion, dapagliflozin consistently reduced BP, body weight, and albuminuria, regardless of baseline renal function. These findings support hard outcome trials in patients with diabetic kidney disease to assess potential nonglycosuria-related long-term benefits of SGLT2 inhibitors in this population. S.P. reports no conflicts. C.D.S., P.J.G., and J.X. are AstraZeneca (Molndal, Sweden and Gaithersburg, MD) employees. F.P. reports having received research grants from AstraZeneca and Novartis, and lecture fees from Novartis, Eli Lilly, MSD, AstraZeneca, and Boehringer Ingelheim, and has served as a consultant for AstraZeneca and MSD. H.J.L.H. is consultant for and has received honoraria from AbbVie, Astellas, AstraZeneca, Boehringer Ingelheim, Fresenius, Janssen, and Merck, and has a policy of honoraria going to his employer. H.J.L.H. is supported by Vidi grant 0.16.156.306 from The Netherlands Organisation for Scientific Research. This article contains supplemental material online at http://cjasn.asnjournals.org/lookup/suppl/doi:10.2215/CJN.10180916/-/DCSupplemental.